Deutsch-Wymysle (now Nowe Wymysle, Poland). Deutsch-Wymysle (also known as Deutsch-Wymyschle and Wymysle Niemieckie and now known as Nowe Wymyśle; coordinates: 52.42872, 19.83330 [52° 25′ 43″ N, 19° 49′ 59″ E]; population in 2013, 183) is located 16.2 kilometres (km) (10.1 miles) south-east of Płock, 24.8 km (15.4 miles) north-east of Żychlin, 35.4 km (22 miles) north of Łowicz, 35.7 km (22.2 miles) north-west of Sochaczew, and approximately 83 km (52 miles) west of Warsaw. It was situated south of the Vistula (Weichsel) River, north of Wymysle Polskie. In 2014 it was a village in the administrative district of Gmina Gąbin, within Płock County, Masovian Voivodeship, in east-central Poland. In 1762 Mennonite emigrants from the West Prussian congregations of Przechovka near Schwetz and of Montau-Gruppe near Graudenz made their way upstream into Poland and settled in the province of Warsaw, district Gostynin, not far from the town of Gombin (Gabin), and founded the Deutsch-Wymysle village and congregation. In 1764 a second group arrived from Przechovka. In 1818-1820 and 1823-1824 a further considerable influx came from Przechovka and the Brenkenhoffswalde-Franztal congregation. 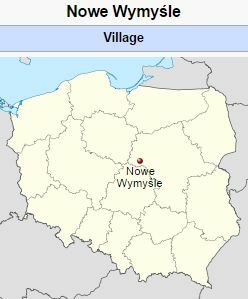 Those who came in these last five years all joined the Deutsch-Wymysle congregation, although they settled for the most part in various villages in the adjacent German Vistula region, such as Piaski, Sordy, Korzykov, Vionczemin, Novosiadlo (Nowosiadlo), Sviniary (Swiniary), Leonor Lyck, Piotrkovek, Lady, Arciechov, Januszev and Sladov. Family names found among these immigrants were Balzer, Bartel, Block, Buller, Dirks, Dyck, Ediger, Ekkert, Frey, Funk, Geddert, Gerbrandt, Gertz, Görtz, Heier, Jantz, Kasper, Kliewer, Kraft, Kühn, Luther, Lyhrmann, Nachtigall, Nehring, Nickel, Pauls, Penner, Ratzlaff, Schmidt, Schröder, Unruh, Voth, Wedel and Wilms. 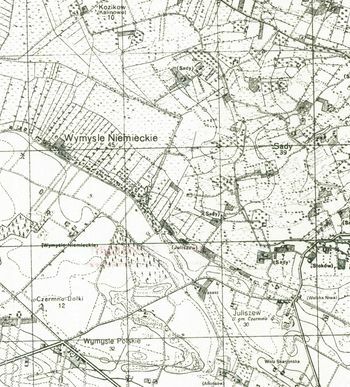 The center of the Mennonite congregation of Deutsch-Wymysle was always located in the village of the same name until its dissolution on 18 January 1945. A chapel and a school were built here between 1764 and 1770. Sometime between 1860 and 1864 the church burned down, destroying the original records of the congregation. It was soon rebuilt of tile with a tin roof. This meeting house was renovated after World War I, so that it looked quite new inside and out. The name of some of the older elders were Wedel, Frey, Peter Buller, Benjamin Unruh, Jakob Voth, Johann Kliewer and Johann Schmidt. Bernhard Voth served as deacon for 35 years, and was followed by Heinrich Unruh. From time to time some families moved to Volhynia and South Russia. Since the 1870s many members of this congregation migrated to North and South America, especially from the Vistula region. Up to that time the congregation had about 300 baptized members; after that the membership continued to decline. In 1883 many members transferred their membership to the Mennonite Brethren congregation, which was founded here through the influence of the Mennonite Brethren of Russia. Elder Jakob Voth died young. His successors, Johann Kliewer and Johann Schmidt, joined the Mennonite Brethren. Thereafter there was no further ordination of a Mennonite elder. The small remaining Mennonite congregation was served by the ministers Peter Kliewer, Peter Foth and Jakob Foth. Only for baptism and communion services was it served by the elder of Deutsch-Kazun. The first transfer of membership to the Mennonite Brethren occurred in 1883, when Heinrich Kliewer of Deutsch-Wymysle and Benjamin Schmidt of Arciechov joined that brotherhood and were rebaptized in Friedensfeld in South Russia. From that time on new members were won nearly every year by Elder Jakob Janz of Friedensfeld, and preachers Nickel, H. Peters and others of the Wymysle congregation were baptized in the Vistula and united with the Mennonite Brethren. Thus a subsidiary of the Mennonite Brethren congregation in Friedensfeld was established in Deutsch-Wymysle in 1884, which was led by Heinrich Kliewer until 1891. On 6 November 1891, Peter Ratzlaff was baptized by H. Peters and admitted into the Mennonite Brethren congregation. Ratzlaff was soon afterward chosen to the ministry and in 1893 to the eldership of the now independent Mennonite Brethren congregation in Deutsch-Wymysle. The first two people Ratzlaff baptized were Johann Kliewer, the Mennonite elder, and Heinrich Wohlgemuth, on 17 July 1893. Kliewer was soon chosen as minister and co-elder of the Mennonite Brethren congregation, and Wohlgemuth as deacon. In 1907 the last elder of the Mennonite congregation, Johann Schmidt, also united with the Mennonite Brethren and was likewise chosen to the ministry by them. Peter Ratzlaff, Johann Kliewer, Heinrich Wohlgemuth and Johann Schmidt served the Mennonite Brethren continuously until they were well advanced in years. The worship services of this congregation were held in the home of Heinrich Kliewer until 1894, and from that time until the end of 1914 in the home of Peter Ratzlaff. From that time until 1945 the services for all the Mennonites of the area were held in the Mennonite church; they were led by ministers of the Mennonite Brethren. By the grace of God the two congregations lived in peace and harmony throughout the 30 years. By emigration to North and South America the Mennonite Brethren also lost many members. At the close of 1914 their congregation had 86 baptized members. In 1920 there were 88. Between 1921 and 1938 new members were added by new converts; a total of 211 members was received during this time, giving the Mennonite Brethren a membership of 175. At the time of the dissolution of Deutsch-Wymysle the Mennonite Brethren membership stood at 157, and that of the Mennonite Church at about half that number. Peter Ratzlaff died on 1 October 1933. During his lifetime, perhaps between 1930 and 1932, a new elder and ministers were chosen by the congregation and ordained by Ratzlaff. These men were Leonhard Ratzlaff as elder, and Heinrich Wohlgemuth and Gustav Ratzlaff as preachers, and Erich Ratzlaff as deacon. Rudolf Witzke was chosen to lead the Sunday school. The Ratzlaffs chosen were all brothers, the sons of the deceased elder Peter Ratzlaff. Heinrich Wohlgemuth was the son of the deacon Heinrich Wohlgemuth, who died on 13 July 1930. Johann Kliewer died in Wymysle on 25 January 1942. Johann Schmidt moved to Deutsch-Kazun at the end of 1930, where he had charge of the subsidiary Mennonite Brethren congregation, which was organized there in 1923. Other ministers there were Edmund Jantz and Rudolf Kliewer. Johann Schmidt died on 26 February 1936. Of the men chosen to the ministry, Heinrich Wohlgemuth moved to Siemenkovo in the Siepr region in 1935 and joined the Baptists; he died there during the war. Edmund Jantz died in Poland after the collapse in 1946. Rudolf Kliewer was taken to Russia by the Russian army. Leonhard Ratzlaff died of exhaustion on 12 August 1946, in Frankfurt-on-the-Oder. Rudolf Witzke was taken to Russia, came back, and died in Stettin on his way to the West. Gustav Ratzlaff immigrated to Canada in 1948. The deacon Erich Ratzlaff also immigrated to Canada. From the two congregations at Deutsch-Wymysle six young men were drafted into the Polish army before the outbreak of World War II. All of them returned. Right after the outbreak of the war 15 more men (old and young) were taken away by the Poles. All of these also returned. Between October 1940 and the end of 1944, 77 young men were drafted into the German army. Fifteen of them fell on the battlefield, and eight remained missing (two of them married men). The others returned. On 16 January 1945, 10 older men were drafted for defense. Of these, one died in a Polish prison camp, six returned, and three remained missing. After the collapse, Heinrich Foth, a teacher, was murdered in Gostynin by the Poles, and Franz Ratzlaff, a farmer, was so mistreated by the Poles on the unsuccessful flight to the West that he died on the day after his return to Deutsch-Wymysle. Among those who emigrated from Deutsch-Wymysle to Fernheim, Paraguay, in 1930 was Friedrich Kliewer, who became a leader in the colony, returned to Germany to secure a doctor's degree in pedagogy, and then returned to Fernheim in 1940 to become the principal of the Fernheim high school until 1944. In the 1950s he was a teacher at Witmarsum, Brazil. Hege, Christian and Christian Neff. Mennonitisches Lexikon, 4 vols. Frankfurt & Weierhof: Hege; Karlsruhe: Schneider, 1913-1967: v. I, 420. Fijałkowski, Paweł. "Mennonite religious communities in Mazowsze prior to 1945." Stowarzyszenie Konserwatorów Zabytków. Catalogue of Monuments of Dutch Colonization in Poland. 2005. Web. 13 September 2014. http://holland.org.pl/art.php?kat=art&dzial=konf_2001&id=23&lang=en. Wikipedia. "Nowe Wymyśle." 17 September 2013. Web. 13 September 2014. https://en.wikipedia.org/wiki/Nowe_Wymy%C5%9Ble. UpstreamVistula.org. "The cemetery of Nowe Wymyśle." Upstream Vistula: German Genealogy Along the Vistula. 2005. Web. 13 September 2014. http://www.upstreamvistula.org/Cemeteries/Cemetery_Distinct.php?id=55&type=recent. Foth, Robert. "Deutsch-Wymysle (Masovian Voivodeship, Poland)." Global Anabaptist Mennonite Encyclopedia Online. 1956. Web. 26 Apr 2019. http://gameo.org/index.php?title=Deutsch-Wymysle_(Masovian_Voivodeship,_Poland)&oldid=162385. Foth, Robert. (1956). Deutsch-Wymysle (Masovian Voivodeship, Poland). Global Anabaptist Mennonite Encyclopedia Online. Retrieved 26 April 2019, from http://gameo.org/index.php?title=Deutsch-Wymysle_(Masovian_Voivodeship,_Poland)&oldid=162385. Adapted by permission of Herald Press, Harrisonburg, Virginia, from Mennonite Encyclopedia, Vol. 2, pp. 42-43. All rights reserved.